Almost twenty years ago, Hamptons’ wealthiest elite destroyed a young girl’s life. 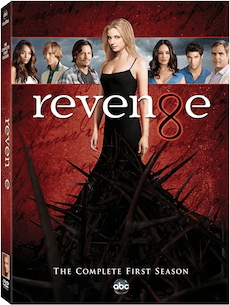 Relive Emily Thorne’s (Emily VanCamp) quest for revenge and uncover every deep, dark secret. The complete first season includes exclusive bonus features including an in-world sit-down interview with the infamous Nolan Ross in “Nolan Ross: Exposed,” “Lifestyles of the Rich and Dangerous”; “Hamptons Bound: Preparing for Life at the Shore”; “Haute Hamptons: Femme Fatale Fashion”; bloopers; deleted scenes and insightful episode commentaries. Nolan Ross Exposed (in-world feature) – What the audience think they know about Nolan Ross (Gabriel Mann) is only part of the story. In the recently unearthed sit-down interview footage, reporter Sarah Juarez (Stephanie Maura Sanchez) questions Nolan on his past … and gets some answers fans might not expect! Roadmap To Revenge – Revenge is sweet, and set within the rich, beautiful, and elite world of The Hamptons, it’s even sweeter. Emily VanCamp narrates some of the checkpoints on the road to revenge, walking fans through the genesis, pilot, themes, and characters of the show. Woven throughout, are interviews from writers, producers and cast members who share how they undertook creating a world where money and desire can make anything possible. At Home In “The Hamptons” – Swank parties and lavish houses are as much a part of “Revenge” as the characters that attend and inhabit them. Viewers can watch as Ashley Madekwe plays tour guide to the not-so-humble abodes – including the plush extravagance of the Grayson’s estate as well as the contrasting rustic ambiance of the Stowaway bar, illustrating everything that goes into making things larger-than-life. Haute Hamptons: Femme Fatale Fashion – They say ‘clothes make the woman’, … and this exciting bonus feature gives a glimpse into the secrets of styling the show’s two leading ladies, Emily VanCamp and Madeleine Stowe. Costume Designer Jill Ohanneson shares key pieces from both of the series’ femme fatale’s closets as she and the cast discuss what it takes to dress a show for success. 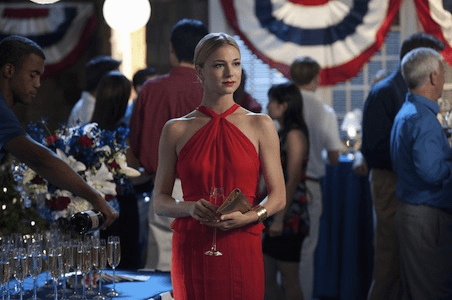 Pilot Commentary – Creator Mike Kelley and Actress Emily VanCamp take viewers through all the details of the pilot episode. The opening scene of Revenge takes the viewer to Emily and Daniel’s posh engagement party. Emily is dusting sand off her hand like she had just been on the beach. Then screams are heard and someone has been shot. The party guests run towards the beach and Victoria Grayson (Daniel’s mother) is screaming for her son. It appears he has been murdered. The story then jumps back to 5 weeks before. Right away, Revenge started out with a cliffhanger that made both John and I have to know what lead up to Daniel being shot and by possibly his fiancee? I was hooked right from the opening scene. As I mentioned before in other posts, we don’t have cable TV so this was my very first opportunity to watch Revenge and I didn’t know much about the show. It stars Madeleine Stowe as the powerful and feared Matriarch of the Grayson family and she quickly became one of my favourite characters. She is one person you would not to be on her bad side as she proves that no one crosses her or her family. Emily VanCamp plays the lead role of Emily Thorne (alias of Amanda Clarke) who I discovered by googling is a Canadian. Emily’s father, David Clarke, was framed by the Graysons as a terrorist who took down a commercial airline and killed hundreds of people 20 years before while Amanda (aka Emily) was just a little girl. Emily is back in the Hampton’s to enact an elaborate revenge plot against the Graysons and anyone else who played a role in framing her father. I loved Emily’s character. She’s soft-spoken and poised and very smart. She’s also a martial artist and a great shot. She’s focused and determined to do whatever it takes to clear her father’s name. She is also rich and has all the resources available to her to buy whatever (or whomever) she wants. Like Victoria, she’s a complex character that you do not want to cross. We learn about what happened with David Clarke through flashbacks that are sprinkled throughout each episode. The treachery runs deep and we can see just how complex the Grayson’s scheme to frame David Clarke really is. I also thoroughly enjoyed watching the chemistry build between Jack Porter and Emily. Jack was a childhood friend of Amanda’s, but he has no idea that Emily is really his old friend and childhood crush. I wanted to see them together and for Emily to reveal to Jack who she really is! Watching Revenge and the gorgeous scenery allows viewers to live vicariously in the lifestyle of the rich and privileged. The beach scenery is beautiful and I would LOVE to live either in Emily’s beach house or the grandiose Grayson Manor. I’m waiting in anticipation to watch Season Two to see what happens! It ended on a cliffhanger (of course!) so I’m anxious to watch it! This is one of my favorite shows and cannot wait for the new season to start!! I only saw a few episodes of this last season, but I liked what I saw. I’ll have to catch up with it sometime.